The United States continues to provide military support and equipment to Mexico in order to help combat its drug cartels. Unfortunately, all is not what it seems. As Jesse Franzblau reminds us, some of the aid has gone to rights-violating security units and even fallen into the hands of the cartels. The Mérida Initiative was negotiated behind closed doors between former presidents George W. Bush of the U.S. and Felipe Calderón of Mexico in March 2007, and was inaugurated in December 2008. The former U.S. ambassador to Mexico, Antonio O. Garza, said months before it was approved that it was “the most aggressive undertaking ever to combat Mexican drug cartels.” U.S. funding for judicial processes, forensic services, investigative capacity, and Mexico’s judicial reforms doesn’t seem to have had much impact so far: impunity remains rampant in Mexico, with 98.3 percent of crimes going unpunished . According to a recent U.N. report, Mexican security agents regularly engage in torture. The U.N. Committee on Enforced Disappearances has also found that the problem of disappearances of civilians at the hands of the police and military is worsened by the government inaction. I recently discussed these issues, by email, with Jesse Franzblau – a policy analyst who has been researching U.S. foreign policy and human rights in Mexico and Latin America since 2006. Franzblau has carried out research and written articles for the National Security Archive, The Nation, Al Jazeera, NACLA, Columbia Human Rights Law Review, the Universidad Nacional Autónoma de México’s Law Review and other outlets. Last year he was nominated, along with Mike Evans of the National Security Archive, and three Mexican journalists Carmen Aristegui, Daniel Lizárraga and Irvin Huerta (all formerly of Mexican news network MVS Noticias ), for the 2014 Gabriel García Márquez Award for investigative journalism for their coverage of secret U.S. surveillance programs in Mexico. The U.S. has maintained a strong presence in Mexico, and has had a deep influence on the country’s political, social and economic affairs. Mexico was strategically important during the Cold War, when the CIA relied on Mexico’s high-level government officials for intelligence, including security chiefs, government ministers, and former presidents of the PRI [Institutional Revolutionary Party] governments, which ruled the country unabated for seven decades straight, until 2000. The CIA maintained contacts with the upper-echelon of the PRI throughout the “Dirty War” period of the 1960s-80s; when three successive presidential administrations orchestrated systematic campaigns of violence against social movements. Intelligence gathering was a high-priority in Mexico for the U.S. during this period, and human rights were not a concern. The U.S. was well-aware that the Mexican government was committing grave human rights violations , but made no effort to publicize the fact to Congress, or elsewhere. Training for security forces has skyrocketed. According to the U.S. Embassy, from 1996-2009, the U.S. trained nearly 5,000 military personnel. According to foreign assistance data , from 2010 through 2013, U.S. training reached over 8,000 members of Mexico’s security forces. In 2009, the U.S. Embassy reported internally that the cooperation with Mexico on intelligence and counternarcotics had never been better. 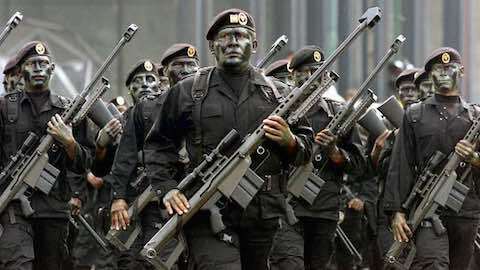 In 2010, they noted that U.S. ties with Mexico’s military had never been closer in terms of equipment transfers and training, as well as intelligence sharing. The documents include files released in response to requests filed through Mexico’s access-to-information law. For example, last December, I obtained adocument [PDF] from Mexico’s attorney general’s office with new information on police connections to the Zetas in the case of the San Fernando massacres, leading to widespread media attention in the Mexican and U.S. press. The release of the document also opened the pathway for disclosure of official records on the June 2014Tlatlaya killings andattempted cover-up, and army files relating to the Ayotzinapa student disappearances. Mateo Crossa is an International Program Intern with the Center for Economic and Policy Research. Article: Courtesy: The International Relations and Security Network.